If you made it successfully through Module #1, then hopefully by now you will have a good understanding of what Bitcoin is, why it is important but also be aware of the significant risks of investing in it. Still, if you are here, then you may be considering investing, as such, there are some key things which I want to teach you about first. Please note: do not worry if you do not understand everything I cover in this section, we will carry out some step by step practical lessons in future modules which will make everything much clearer. Before we start, I wanted to list some of the most important terms that I will be using so that you are aware what they mean when they come up. I have already covered some of these terms in Module #1, but I am aware some people may skip or skim read specific modules. Don't feel that you need to read and understand them all just now; you can just come back and reference them later. In time, these terms will become commonplace for you. Fork: the process by which a blockchain splits into two separate blockchains, if the new blockchain is maintained by miners then it will create a new coin. Bitcoin has been forked many times, for example there is another coin called Bitcoin Cash, which is like Bitcoin in some ways but very different in others. It is important that you are aware which Bitcoin is the original Bitcoin. This is by no means a conclusive list; this is enough for you to cover the basics. I will, in time, produce a comprehensive glossary of terms. These are the ones which will get you by in your early days as a Crypto investor. If you are going to buy Bitcoin, you are most likely going to start interacting with an exchange. This is a place where you buy and sell Bitcoin from, and there are many of them and they can be very different from each other. When considering exchanges, you need to be aware of the term trading pair, which is what currency you can buy/sell Bitcoin with. You will most likely buy Bitcoin with fiat (you know the £pounds or $dollars which I mentioned earlier, though some exchanges offer a wide range of options, including with other cryptocurrencies. The trading pair is separated into a base currency and a quote currency, So if the trading par is BTC/GBP, it will quote the price of 1 Bitcoin in GBP. Fiat: ones where you can buy and sell Bitcoin using fiat (your local currency such as £ pounds or dollars). With this type of exchange, you can usually deposit money onto the exchange using your bank account or buy some Bitcoin using a debit or credit card. They will provide an exchange rate and charge you a fixed % of the transaction for the service. Cryptocurrency: this is where an exchange will let you buy and sell Bitcoin with other cryptocurrencies. There are more of these types of exchange available as many exchanges have found it hard to find banking services for their customers to be able to withdraw and deposit fiat. Essentially with these exchanges Bitcoin is the base currency for trading altcoins, though some also offer what is known as stablecoins, which are cryptocurrencies pegged to a fiat currency, usually the US Dollar. Decentralised (DEX): we will not be covering decentralised exchanges in this course, but you should be aware of them. The inherent risk of a centralised exchange is that you must hold coins on the exchange to make a trade, as exchanges are vulnerable to hacks, your coins are at risk when held there. There has been a proliferation of projects, dedicated to building decentralised exchanges, whereby your coins never appear on the exchange. I wouldn’t worry about them for now. Again, if you are finding this difficult to understand, I will take you through how to setup and buy/sell on an exchange in the next module, step by step. While there are many exchanges out there, for your first lesson in buying I am going to use Xapo. <UPDATE> Note: if you do click on that link above, it is a referral link, if you deposit $100 or more in the next 180 days then I will receive a $10 bonus. If you would rather not use the referral link, or give the referral bonus to a friend, please use this link instead. I will take you through the process of signing up to Xapo, how to set it up correctly and how to buy and sell Bitcoin in Module #3. A wallet is where you store your Bitcoin, but they can take many forms so it is worth reading this carefully and I will do my best to explain them all. The first point I want to make, which may sound complicated but is worth understanding; your Bitcoins are never actually in a wallet, your wallet is just a way of interacting with the blockchain. If you want someone to send you Bitcoin, then you give them this address as this is where they will send it to. Likewise, if you're going to send someone some Bitcoin, they will provide you with something which is similar. These addresses are public, and therefore anyone can scan the blockchain to see how much Bitcoin is stored against that address. The address I showed you above is for what is known as the Genesis Address, the very first Bitcoin address created by Satoshi Nakamoto. To see how much Bitcoin is in a wallet, you can use a website which has a blockchain explorer, enter the address and see the balance and any incoming or outgoing payments. An example website you can do this on is Blockchain.info, try going there now, entering the address in the search bar above and you will see the balance and transactions, I have included a screenshot below anyway. The public key is often confused with the wallet address. It is a long string of numbers and letters which allows addresses to be generated by hashing the public key. Don't worry about hashing right now, all you need to know is that you can create multiple addresses for a wallet from the public key. More than likely, especially in your early days, you won't be using your keys, you will use a website or a wallet which will handle this for you. Note: If somebody finds your public key, they can't do anything with it or steal your Bitcoin. As mentioned with the public key, to begin with, you will more than likely not have access to or use your private key directly. Sites like Xapo and some of the wallets will handle this for you. Warning: If somebody finds your private key, they can steal your Bitcoin, you must protect it at all times, something we will cover later. I won't get into the world of explaining cryptography and how this all works right now, really, I just want you to be aware of what makes up a wallet. Again, don't worry if this is all confusing, once we start making wallets and sending coins it will all start making sense. Okay, so, remember earlier when I mentioned that your wallet doesn't contain Bitcoin, what I meant by this is, your balance and transactions are all stored on the blockchain. What a wallet does is access the blockchain to confirm your balance, allow you to create new transactions and confirm receipt of Bitcoin from others. There is no actual physical storage of your Bitcoin on the device; this is important because when we start looking at hardware wallets, if you lose your device, you can still access your coins by restoring it. It isn't a case that if you lose a wallet, then those coins are lost because they are stored on it. Hardware wallet: this is a physical device which you can connect and disconnect from your computer to manage your Bitcoin. They are very secure and fast becoming the most popular type of wallet. Software wallet: this is a software application which you can download to your computer, generate a wallet and manage your Bitcoin from. Online wallet: this is similar to a software wallet, but you access and manage it from a web browser like Safari or Chrome. Paper wallet: yes, you can create a paper wallet, this is where you print and secure your public and private addresses and keep them stored securely offline. This is also known as cold storage. These are often seen as one of the most secure ways of securing your Bitcoin but are falling out of favour due to the convenience of hardware wallets. Exchange wallets: an exchange will give you a wallet for each coin you store with them. You can move your coins from wallet to wallet, so for example, say you were to buy some Bitcoin on Xapo, they would be stored in the wallet they have generated for you on their website or app. You may then want to keep them in your hardware wallet, as such you would send your Bitcoin from your Xapo wallet to the address for your Bitcoin wallet on your hardware device. Okay, still with me? Again, this will all become much clearer once we move onto the practical steps. If you considering investing in Bitcoin, then please go and buy a hardware wallet now. I am serious, just bite the bullet and buy one now as it is the best way of safely storing your Bitcoin. I know people who have been hacked and lost a lot of money. It is a small investment for peace of mind. I own both, I prefer the Ledger device, but I prefer the interface for interacting with the Trezor. Both are suffice and I am sure whichever you choose you will be happy. My recommendation is that whichever you buy, you buy two. The first one you will set up as your primary device, the second you will keep as your backup to restore your balances should you lose or damage your primary device. Warning: I would recommend you only buy your hardware wallets directly from the manufacturer. I would never take the risk that someone may have tampered with a device when buying from somewhere like eBay or Amazon. Note: the above link for Ledger is a referral link; I get a small kickback if you choose to purchase with that link. 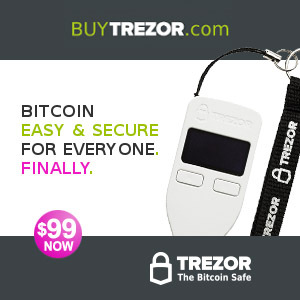 If you would rather not, then please use these: Ledger or Trezor. Okay, so hopefully now you have some idea of what a wallet is, we now need to move onto security. There have even been cases of smart hackers gaining access to peoples mobile devices. There are plenty of useful resources on how to store your coins securely, but I found that they tended to be quite complicated and offered options which only suited people with advanced computer skills. I have therefore put the following together as a more usable way of managing your security. Following these simple rules, you should be able to protect your investments. In time, you can learn more advanced techniques. Note if any hacker or potential kidnapper is thinking of breaking into my house or kidnapping and torturing me: to get access to my coins, then I want to save you the time. I am a public profile, as in you can quite quickly find out who I am and where I live. Because of this, my security procedures are quite sophisticated, and I do not keep any crypto devices, passwords or logins in my home or business addresses. They are held in a secure off-site location which has both tech and physical security restrictions in place to gain access and create transactions require two people. So if you come to my house with a gun or some pliers to pull out my teeth, I won't be able to do anything, even if I wanted to. Oh, and if you didn’t read the story about how I lost most of it due to poor investment decisions then you won’t realise I don’t have much Bitcoin left anymore, anyway. Buy a hardware device: as mentioned previously you should buy a hardware device; this secures your Bitcoin by separating your wallet access from the Internet. I don't use software wallets as I am always worried about my computer being compromised. Be careful with passwords: when signing up for an exchange or creating a password for anything, always use unique passwords which are random collections of numbers, letters and symbols. If you use the same password for your Xapo account as you do for lots of other websites, if this password becomes compromised then it could be used to test and attempt to gain access. Also, don't use things like 'Password123' or '123456789', you are just asking for trouble. Always use Two-Factor Authentication (2FA): whenever signing up for any Crypto service, you should always use Two-Factor Authentication. You can use either Google Authenticator or Authy, which are applications which create a randomly generated code every 30 seconds to ensure you are the person trying to log in. DO NOT use SMS-based Two-Factor Authentication, ever as your phone can be compromised by smart hackers. Don't attach your phone number to your email accounts: sites such as Gmail will ask you if you want to store your phone number as a backup for if you forget your login. Do not do this as hackers may attempt to use this as a way of compromising your phone and gaining access to your 2FA. Never log into your Bitcoin accounts on public wifi: and I mean NEVER. Public wifi is often scanned by hackers looking for people accessing their Bitcoin. There have been numerous examples of people having their accounts hacked and Bitcoin stolen in this way. Consider installing a VPN on your computer from a trustworthy provider: this way, even if someone can snoop on your Internet activity, a VPN will securely encrypt everything you are doing. Be careful with mobile wallets: if you decide to use a mobile wallet as you want to keep crypto with you at all times then please only hold small amounts in it. Be careful keeping coins on an exchange: it might not be practical for you to keep all your Bitcoin off of an exchange, therefore be prudent with the decisions you make. Personally, I never keep anything other than a very small amount on an exchange for convenience, and that itself is rare. There are plenty of other even more sophisticated things you can do to protect your Bitcoin, but those above have ensured that I haven't once been hacked. Please though, never cut corners, make sure you review your security all the time. Even a small investment can grow considerably, and you should always be prepared for the worst. Okay so I know a lot of this might be confusing, but I promise, in time, most of this will become a lot clearer as you start buying Bitcoin and moving it around. Now you understand the basic concepts around Crypto Assets, you are ready to move onto Module #3 and make your first investment.